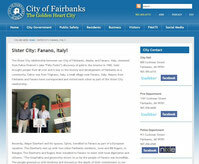 Fairbanks Sister City: Fanano, Italy! The Sister City relationship between our City of Fairbanks, Alaska, and Fanano, Italy, stemmed from Felice Pedroni’s (aka “Felix Pedro”) discovery of gold in the Interior in 1902. Gold brought people from all over and is key to the history and development of Fairbanks as a community. Felice was from Trignano, Italy, a small village near Fanano, Italy. Mayors from Fairbanks and Fanano have corresponded and visited each other as part of the Sister City relationship. Recently, Mayor Eberhart and his spouse, Sylvia, travelled to Fanano as part of a European vacation. The Eberharts met up with two other Fairbanks residents, June and Bill Rogers, in Bologna. The Eberharts and Rogers then travelled to Fanano to meet with local dignitaries and citizens. “The hospitality and generosity shown to us by the people of Fanano was incredible. The people greeted us with kindness and showed us the depth of their commitment to our relationship,” Mayor Eberhart said upon his return. It was the first visit for the Mayor and Sylvia, but the second visit to Fanano for June and Bill Rogers. Local government officials, businesspersons, and citizens attended events with the Alaskan visitors to discuss ideas and initiatives for outreach between the two communities. Efforts and exchanges between Fairbanks and Fanano will be focused in the areas of culture and arts, sports, education, and economic development. A number of exchanges of works of art have already happened between our two cities; the large sculpture in front of City Hall in Fairbanks entitled “Il Ponte” (“The Bridge”) symbolizes the connection between our communities. A youth choir group from Fairbanks travelling through Europe went to Fanano to perform last year. Future exchanges in culture and arts may include hockey coaches and players, symphony and opera performers, chefs, and works of art being sent for display. Representatives from the Fairbanks Arts Association, the Fairbanks Symphony, Fairbanks Light Opera, Ice Alaska, and other agencies have met to discuss avenues for cultural sharing. A Fanano Sister City Workgroup has started meeting monthly at Patrick B. Cole City Hall. We will work to see if we can provide assistance in obtaining J-1 Student Visas in order to try to give some Fanano students work opportunities in Fairbanks in the summer. The burgeoning peony market in Interior Alaska is another potential avenue for summer workers. A number of businesses may be interested in reaching customers here in the Interior or elsewhere in the Lower 48: companies producing ham/prosciutto, cheese, jam, and mining and engineering equipment. During the visit to Fanano, the remains of Felice Pedroni were relocated to a church in Trignano, his home village. The ceremony was well attended by citizens and government officials. Posters were hung throughout both communities proclaiming “Felix Pedro Comes Home.” Felice is revered in both Trignano and Fanano. A museum on the history and life of this trepidatious miner is now located in Trignano. We hope to see a contingent led by Fanano’s Mayor visit Fairbanks next July during our Golden Days celebration. If you have ideas or would like to participate in the Fanano Sister City Workgroup, please contact our offices at 907.459.6793.